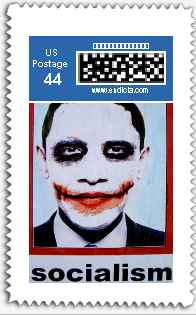 Take one photo, apply some Photoshop, mix in some controversy, and pour into one U.S. postage stamp. I am totally on board with this. I can see me creating an entire line of these to use on everything that leaves my home from now on. This was created using Picture It Postage. Go ahead, give them a look. I'm sure you can think of a thousand different photos you would like to see on a postage stamp.